Softberry GenomeSequence Explorer allows visualization of many features, such as known and predicted genes, mRNAs, EST, promoters and many others, on large genomic sequences. On this server, GenomeSequence Explorer shows these features for human genome draft from UCSC Human Genome Project Team. In addition to publicly available information, GenomeSequence Explorer includes genes predicted by Softberry's FGENESH++ program. GenomeSequence Explorer can be used to extract nucleotide and protein sequences of particular genes, functional sites and other features. These sequences can be viewed by right-clicking features of interest in Gene Explorer's main window. GenomeSequence Explorer is not as fast through the Internet as it is locally, so please be patient. Click here for use restrictions. GenomeSequence Explorer has search function that helps you visualize features of interest on a genome. Features can be searched by GenBank AC number (mRNAs and known genes), EST ID, cytogenetic band name, repeat name or FGENESH++ predicted gene ID. Search can be performed only on feature types loaded into memory (Options > Load Feature Types option, see below). To start search, press FIND FEATURE button or select Search > Find Feature option from a menu. Find Feature dialog is displayed, where you can specify search conditions. After search was performed, a list of found features is displayed. To view a feature and its surroundings on genome map, click on a feature from the list and press LOAD button. List of found features is stored in memory until new search is performed or GenomeSequence Explorer is exited. Chromosome can be selected from Chromosome Selection Dialog Box. To open it, either choose Options> Chromosome from main menu or press Chromosome button. In Chromosome Selection Dialog Box, select chromosome from pull-down list. Then select chromosome region to be loaded. It can be done using a ruler just below the pull-down list, or by entering selected sequence boundaries' positions in fields FROM, TO and/or SIZE. By default, a 600-kb fragment of chromosome 1 is loaded. Please keep in mind that the larger selected region, the longer it will take to load and the slower to navigate. Shift-dragging region's boundary - in this case both boundaries expand or retract to the same extent. Boundaries of selected region are displayed in fields FROM and TO below chromosome's map, and its size in SIZE field. To select by sequence position, enter start and end positions in the fields FROM and TO, or start (end) position and length in fields FROM (TO) and SIZE. Press ENTER key or move cursor to another field to record entered values. If entered values in any of the fields go beyond chromosome's boundaries, they are corrected and new values are displayed in the fields. Changing value in one of the field may result in change in another - e.g. entering new value in FROM will change value in SIZE. Selected region may be shifted to the left or to the right by pressing buttons <>. The size of the shift must be entered in the field between these two buttons. Default value is 10 MB. After selection is made, pressing OK closes Chromosome Selection Dialog Box and displays part of selected region in Explorer's main window. By default all features are selected in both LOAD FEATURES TYPES and FEATURES dialogs. Search can be performed only among loaded features. 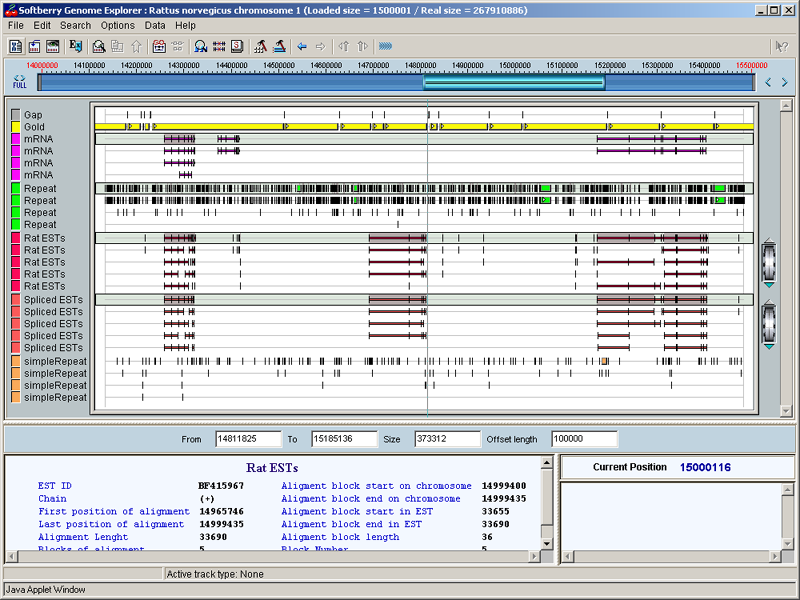 After choosing chromosome region and features, a fragment of loaded region is displayed in the main window. You can change size and location of displayed fragment using ruler and boundary/size fields the same way you did it in Chromosome Selection Dialog Box. But in the main window, a ruler represents loaded chromosome region rather than whole chromosome. You can also move along the region's length by dragging main window map by mouse to the left or to the right. Shift-drag to the left decreases map resolution, while same move to the right increases it. If option "Repaint on Drag" is enabled (default), the map moves along with mouse. If it is disabled, map is redrawn only after mouse button is released. Finally, you can choose a region on the map by Ctrl-dragging, and this region will expand over whole window. Maximal resolution of GenomeSequence Explorer is one base pair per pixel. Features of selected region are displayed in the middle section of main window. Each feature type is shown on its own line(s). By default, if features of same type overlap on sequence, they are shown on separate lines, while top line for each type of features (shaded in gray) shows all features of that type combined. You can switch off display of combined lines or separate lines by choosing Options > Feature Show Mode > All Objects or > Combined Objects. When mouse pointer touches some feature on the map, it changes its shape to a hand. At that time, if option "Show Information on Mouse Over" is enabled (default), available information on each feature is shown in left bottom panel (Feature Info Panel). If that option is disabled, you must click left button to get information displayed. If mouse pointer is located over multi-block (multi-exon) feature, like gene or EST with several alignment blocks, Feature Info Panel is divided into two sections. In left section, information about whole section is displayed, while in right section, information about selected (pointed to) block. On top of main window's ruler, there are buttons "Back" and "Forward" which operate in a way similar to same buttons in Internet browsers. Show Sequence - (+) and (-) - Shows nucleotide sequence around the point clicked, positive or negative strand. Show Feature Sequence - (+) and (-) - Shows nucleotide sequence of a given feature on either of two strands, as well as short flanks. Enabled only when pointer is located over a feature (hand-shaped). Show Block Sequence - (+) or (-) - shows nucleotide sequence of a given block (exon). Show Protein - Shows amino acid sequence of gene product. Enabled only if gene is pointer is located over a gene. Show Entry - Shows GenBank entry for mRNA or EST. Sequences and entries are shown in a separate window. Options of sequence display are determined by Sequence Options menu (Options>Sequence). Sequences of selected features are shown in bold capital letters, while flanks are shown in lowercase. Exons on exon-containing features (gene, mRNA, EST), are highlighted in blue. Selected exons, if any, are shown in red. Exit - exit the viewer. Find Feature - opens dialog for feature search. Found Feature List - shows last feature search results. Chromosome - Choose chromosome to view. Features - Choose features to view (only those loaded by Load Feature Type can be viewed). Load Feature Types - choose features to load in computer memory. Sequence - Select sequence display options: flank lengths for feature sequence display, length of sequence to be displayed, numbering options etc. Repaint on Drag - If enabled (default), view is updated continuously when drag operation is performed by mouse. If disabled, view is updated only when drag operation is finished (mouse button released). Show Information on Mouse Over - If enabled (default), information on functional site is displayed if mouse is located over that site. If disabled, information is displayed after a click on a functional site. Show Navigation Line (default enabled) - displays vertical line at the location of mouse pointer. Allow Visual Map Navigation (default enabled) - allows navigation by dragging map by mouse to the left or to the right. Feature Show Mode - choose between displaying overlapping features of same type on separate lines (All Objects), on one line (Combined Objects) or both. Also, Full Mode displays each individual known overlapping EST or mRNA on a separate line, while Compact Mode displays only one EST/mRNA of a class.